Created by husband and wife team Josh Baum and Ann Gordon, The Ranch House in Santa Fe is a place that offers something for everyone. From healthy salads to delicious smoked meats, The Ranch House in Santa Fe, New Mexico, is the perfect place for a night out on the town with loved ones, family, and friends. The Ranch House is committed to serving only the best food to its customers. By using the freshest ingredients as well as hormone-free and antibiotic-free meats provided by local farms, The Ranch House knows that the meals it prepares are the best. At The Ranch House, staying committed to offering the best food possible for everyone while maintaining high culinary standards is important. Reservations for The Ranch House can be made by calling the restaurant directly at 505-424-8900. · Lunch - Available Monday through Friday from 11:00am to 2:30pm; lunch specials: soup of the day and salad combo, an assortment of sandwiches, baby back rib plate, brisket or pork small plate, quesadillas, burritos, nachos, and more. · Dinner - Appetizers: nachos, pork sliders, waffle fries, chips and salsa, smoked wings; An assortment of salads; sandwiches, steaks and burgers, smoked meat plates, and more. · Desserts - Made-from-scratch desserts such as brownie sundaes, apple crisps, creme brulee, and more. · Kids (12 and under only) - BBQ or chicken strip plate, cheese quesadilla, penne pasta, burgers, and sandwiches. 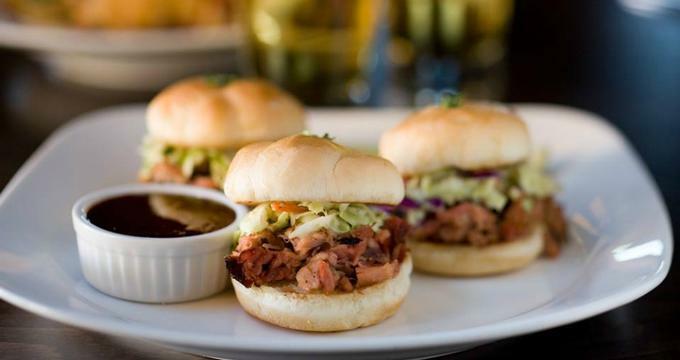 · Bar Bites Menu - Happy hour appetizer special, pulled pork sliders, queso salsa sampler, and tacos. · Drinks - Specially priced draft beers, pineapple margaritas, house wines, and cocktails. · Meats - Pulled pork, brisket, smoked half chicken, and baby back ribs. · BBQ Packs - Family, value, rib and big house BBQ packs that offer meat, sides, and cornbread to feed multiple people. · Sides - Cornbread, mac n’ cheese, chile slaw, squash, potato salad, and more. The full BBQ to go menu is available on The Ranch House website. Customers are encouraged to call in orders in advance to reduce wait times.